The History of the Blackwood Avenue of Honour and the Honour Boards. Compiled by Margot Hitchcock, Historian for the Blackwood & District Historical Society. November, 2018. 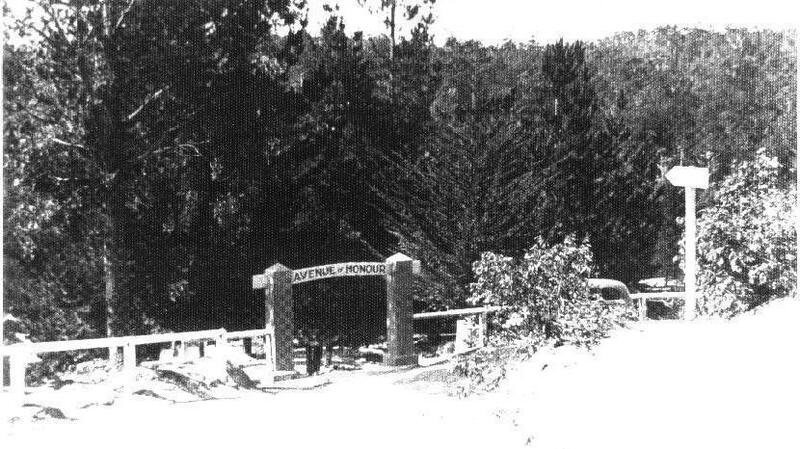 In 1919, the Avenue of Honour from the main road to the Mineral Springs area was graded and formed and 80 pine trees were planted, which were provided by Bill and Ken Matheson and Tom Vigor. The lower parking area was then levelled through a working bee. The Avenue of Honour was erected to honour all the men from the Blackwood area who enlisted in the 1914-1919 1st World War. Some were lucky enough to return to resume their lives in Blackwood. Others made the supreme sacrifice by losing their lives in some far distant country from their beloved Blackwood. The Avenue of Honour had a significant entrance marked with two solid column constructions with a timber sign above attached to the top of the columns with the words “Avenue of Honour”. Inside this entrance on either side were two monuments with a small cannon mounted on each monument. Leading down to the mineral springs were the Pine trees planted to honour the men who died for their country, each tree had a name tag to honour one of those men who died. 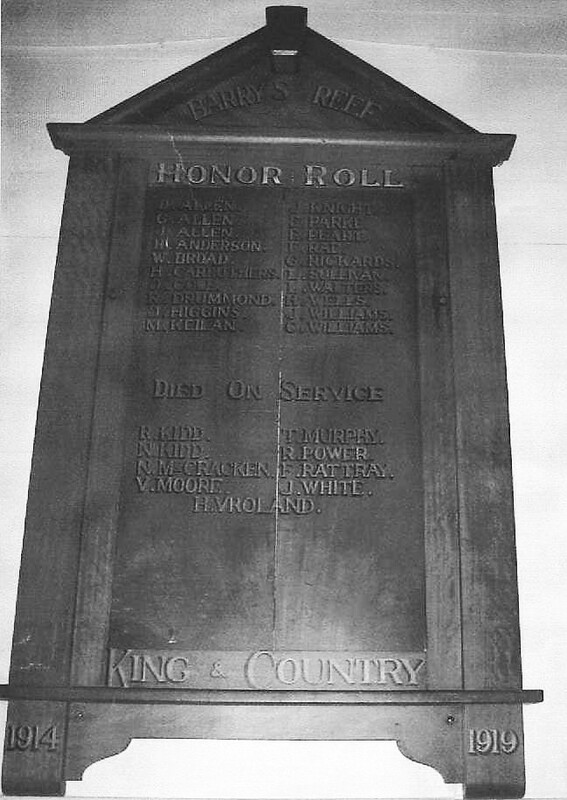 The Honour Roll Boards – Have you ever looked at the two boards hanging in the Blackwood Hall and wondered about the men behind the names..??? The 2nd board hanging in the Blackwood Hall is the Barrys Reef board. 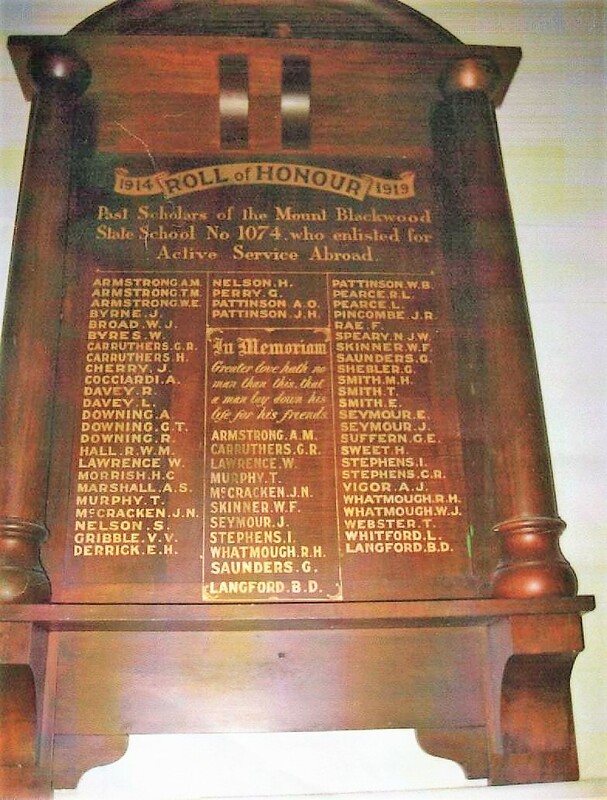 The 48 names of these men who enlisted for active service on the 1914-1919 “Roll of Honour” board, mounted in the Blackwood Hall which states “Past Scholars of the Mount Blackwood State School No. 1074, who enlisted for Active Service Abroad – in a small list in the middle is written -In Memoriam – Greater love hath no man than this, that a man lay down his life for his friends” this is for the eleven men who died during active service whose names are in the first list. Whatmough R.H.*, Whatmough W.J., Webster T., Whitford.L., Langford. B.D.*.. * = died on active Service. Barrys Reef Honour Board as seen in the Blackwood Hall. H. Wells, J. Higgins, J. Williams, M. Keilan, C. Williams. DIED ON SERVICE – R. Kidd, T. Murphy, N. Kidd, R. Power, N. McCracken, F. Rattray, V. Moore, J. White, H. Vroland. Frederick Norman Rattray – Roll of Honour Service Number – 1508 : Next of Kin – (Father) RATTRAY James. Service: Australian Army, – 1914 – 1920 – 10th Batt infantry. Age 32, joined 9.12.14. Killed in action 19/6/17 – in field, buried Villiers Brentonneux memorial France. Son of James & Margaret Rattray died age 34 yrs. James Rattray was Head Teacher at Barrys Reef School from 1886 – 1887. 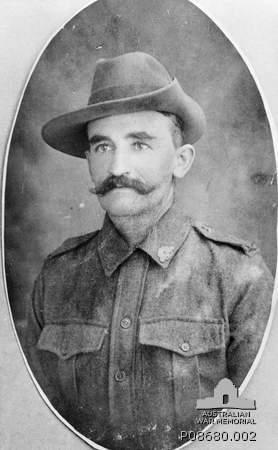 James Emil Huntly Vroland – Roll of Honour Service number: 855, Rank: Corporal, Unit: 23rd Battalion (Infantry), Service: Australian Army, Conflict: 1914-1918, Date of death: 29 November 1915. Cause of death: Killed in action, Cemetery or memorial details: Lone Pine Cemetery, Gallipoli, Turkey. War Grave Register notes: VROLAND, Cpl. James Emil Huntly, 855. 23rd Bn. Australian Inf. Killed in action 29th Nov., 1915. Age 24. Son of Janet Huntly Vroland, of Carlton North, Victoria, Australia, and the late Carl H. F. Vroland. Native of Barry’s Reef, Victoria, Source: AWM145 Roll of Honour cards, 1914-1918 War, Army. Carl H. F. Vroland was Head Teacher at Barrys Reef School from 1891 – 1899. James Emil Huntly Vroland was born in Blackwood in 1891. His mother was Janet Scott and his father was Carl Hakam Ferdinand Vroland. (Digger records). 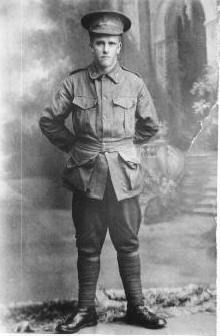 Neil Kidd – Roll of Honour – Service number: 1740, Rank: Private, Unit: 23rd Battalion (Infantry), Service: Australian Army, Conflict: 1914-1918, Date of death: 7 September 1915. Cause of death: Died of wounds, Cemetery or memorial details: Lone Pine Memorial, Gallipoli, Turkey. War Grave Register notes: KIDD, Pte. Neil, 1740. 23rd Bn. Died of wounds at sea 7th Sept., 1915. Place of Enlistment – Melbourne VIC : Next of Kin – (Father) KIDD Arthur of Yea. Died at sea 7/9/15 – shrapnel wounds to jaw and throat – wounds received in action at Gallipoli died on board the S.S ‘Maheno’. Buried at sea off Lemmos. Chaplain D.Dutton. Mabel Johnston was the mother of May Johnston, the child of Neil Kidd (ex-nuptial) born 29/6/1911 at Yea. Source: AWM145 Roll of Honour cards, 1914-1918 War, Army. Robert Kidd – brother of Neil Kidd – Age 20 yrs & 9 months – Sergeant – Blackwood Sawmiler. Fourth Light Horse regiment. 2nd Anzac mounted regt. Later 2nd Lieutenant, 58th battalion. Joined 20-8-14. Killed in action in the field – 25/10/17. Robert Power is listed as from Barrys Reef, Service No. 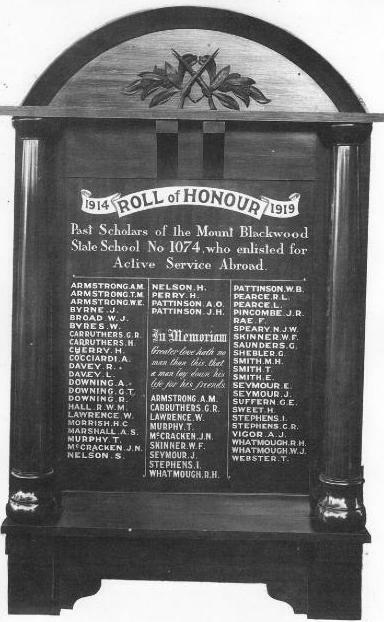 9534 died in France on 6th June 1917 and attended the State School Blackwood. Robert Power – Roll of Honour – Service number: 9534, Rank: Sapper, Unit: 11th Field Company Australian Engineers. Service: Australian Army, Conflict: 1914-1918. Date of death: 6 June 1917, Cause of death: Killed in action. Cemetery or memorial details: Nieppe Communal Cemetery, France. War Grave Register notes: POWER, Spr. Robert, 9534. 11th Field Coy. Australian Engineers. Killed in action 6th June, 1917. Age 42. Son of Robert and Johanna Power. Native of Ballarat, Victoria, Australia. II. A. 6. Ellen Power was the mother of the late Grace Rayner who wrote the Poetry book ‘A Selecion of Blackwood Poems and Other Verses.’ Grace Rayner was the niece of Robert Power. 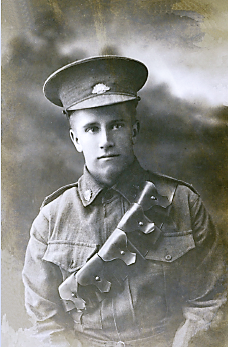 Studio portrait of 9534 Sapper (Spr) Robert Power, 11th Field Company Australian Engineers, of Ballarat, Vic. A prospector prior to enlistment he embarked with No.4 Section from Outer Harbor, SA on board HMAT ‘Suevic’ (A29) on 31 May 1916. On the morning of the 6 June 1917, at “Stuff Camp” Pont Nieppe, Spr Power was instantly killed by a shell which landed in the camp, he was 42 years of age. Spr Power is buried at the Nieppe Communal Cemetery, France. John Neil McCracken from Blackwood, died on the 27th September 1917 in the Polygon Wood and is buried at Ypres Memorial in Belgium. John McCracken was only 20 years of age when he died and had been a Pupil Teacher at the Blackwood State School for two years. His Unit number was 4146 and he was in the army in the 57th Battalion. His birth place was Barrys Reef Blackwood. His parents were listed as John McCracken and Helen Amelia McCracken, and his brother was listed as Charles McCracken. John Neil McCracken is named on the Barrys Reef Honour board as N.McCracken, and on the past scholars of the Mount Blackwood school as J.N.McCracken. VIGOR Arthur James : Service Number – 6124 : Place of Birth – Ballan VIC : Place of Enlistment – Geelong VIC : Next of Kin – (Father) VIGOR Thomas C/- Blackwood Post Office. Occupation Sadler, age – 21 yrs and 10 months, defective heart and teeth. Joined 15/3/16. 14th Btn. Reported missing France – 11-4-1917. Taken Prisoner of War in Reincourt, France- Captured 11/4/1917-Interned by Germans at Dulmen/Zerbst- Repatriated Hull, England 2/1/1919. Returned to Australia 12/7/19. Discharged 8/10/1919. Ref. – First Australian Imperial Force Personnel Dossiers, 1914-1920, Aust. War Archives.